I’ve been testing a low-chill apple named Shell of Alabama, which hails from (you guessed it) Alabama, a hot, humid part of the USA. I’d swear that it was related to Anna and Dorsett Golden as it is their equal in vigor and early season bearing, but it is about 100 years older than them or their common parent, Golden Delicious. It has not shown quite their fireblight resistance, but for the most part has been trouble-free. The tree in the photo is two years old and I had already thinned 2/3 of the apples off of it, having to use a pair of scissors because they were so thick. I will be anxiously awaiting a taste test, but if anything it is a much superior pollinator for Anna and Dorsett than the detestable Ein Shemer. Each year I go through about 15-20 new varieties to test them in our climate. 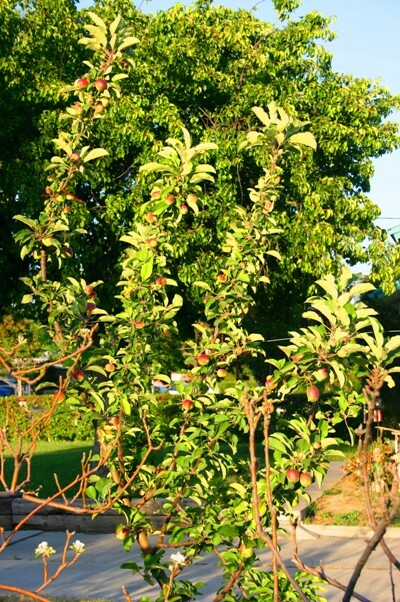 To speed this process up I graft them onto a mature Fuji tree where they usually bear fruit the second year, sometimes the first year if the scion has a fruit bud on it. The tree ends up with many tags fluttering in the breeze that marks the different varieties. 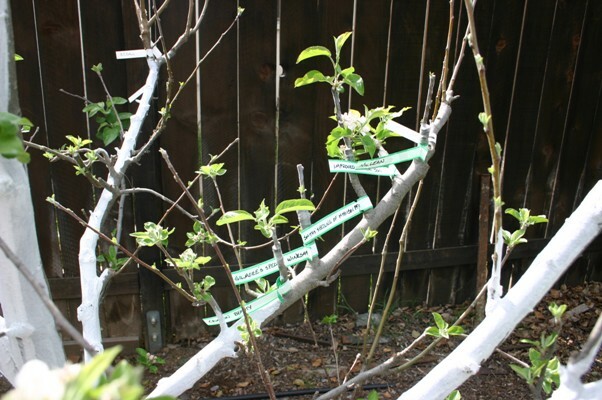 The varieties that prove “worthy” get grafted the next year onto their own rootstock and planted somewhere to produce more scionwood for grafting. It’s always exciting tasting an apple that has been grown in our climate for the first time; you never know what to expect.